Those funny looking recesses on the front bumper of the Rialta are actually designed for a set of VW fog lights. The front bumper is a standard EuroVan part made by Volkswagen. 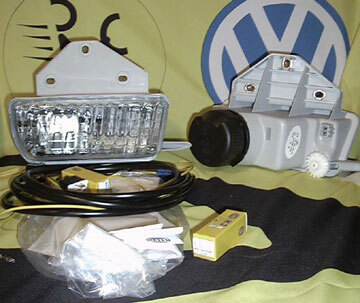 Unfortunately, the semi-complete EuroVan chassis that VW supplies to Winnebago does not include the steel brackets and other mounting hardware for the fog lights that are normally found on a regular full size EuroVan. And unfortunately, VW does not sell the mounting brackets as a separate part in the US. Most VW dealers won't carry these fog lights in stock but rather would special order them and require you to put up a sizeable down-payment. They are not very likely to allow you to "look-and-see" before you decide to buy them. There are numerous third party fog light products on the market. You should be aware that the openings in the bumpers are not a symmetrical shape and they may not completely fill the cut-out opening in the bumper. Will they fit into the recesses of the bumper? How will they attach to the frame or body? How do I wire them into the existing circuitry? Unfortunately, it doesn't appear that there are any ready-made lights that are a direct fit into a Rialta. And right now, I know of no other sources that sell a fog light made specifically for the EuroVan other than the VW dealership. And as previously mentioned, the Rialta lacks the mounting brackets. regardless of whether you buy the OEM VW lights or elect to purchase 3rd party lights, you'll still need to fabricate your own mounting brackets. To this date I have no heard of anyone accomplishing such a task so you're on your own.